Lately I have rediscovered something which I am sure, if you have ever made a gift for someone will come as no surprise. Creating art is a pure expression of pure love. 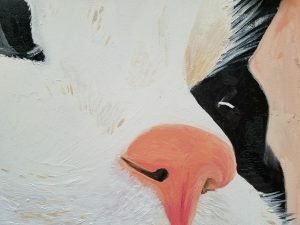 My paintings of my cat and dog are wonderful examples. 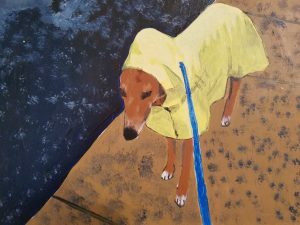 When I am thinking about painting and choose a subject, my pets are by far my favorite subject. I love them and so by translation I love painting them. Their funny expressions remind me of a moment that we had together and make me smile. And then I get to walk by and look at the painting later on and enjoy reliving that moment again. I would love to be able to paint the humans that I love, but I my ability to paint humans is not quite up to a standard where I won’t get mocked by my teenage boys, who blessedly are not full of the tact of grownups and will say what is truly on their minds. different way than if I am purely thinking about what to make. There was a moment when I was at Haystack school of Craft in Maine and I was stuck. I was purely thinking about what I wanted to make with the objects that I had. When I thought about people I wanted to make things for, my whole approach changed. That is when I started making my enamel cats. They continue to be one of my favorite all time things that I have made. I don’t sell them, I just gave them away and they are the best. They make me happy when I look at them and I made each one with a specific intention of who I was going to give it to. My encouragement for this week is to consider something you love. A person, a pet, a place. Then think about how you can make that love tangible. You don’t have to give away what you make, maybe it is a picture of your pet that you love and hang on your wall. Or maybe it’s a beautiful handmade card that you make for a friend. If love is your inspiration whatever you make will turn out magnificently!